My life long dream was to find a little house in Rehoboth Beach and paint there for the rest of my life. Oh, well. I enjoy greatly painting in Delaware. I love the landscape, it is so rich in diversity from the bay to the Atlantic shoreline. 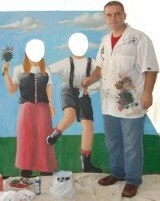 Demolli Fine Art Studio offers full services in Delaware. We provide the highest quality mural paintings, custom faux finishes, and decorative arts services avalaible today. Call today for a free quote. Mural of Kalmar Nyckel, Lewes, Delaware. Mural of Kalmar Nyckel and the Light house. 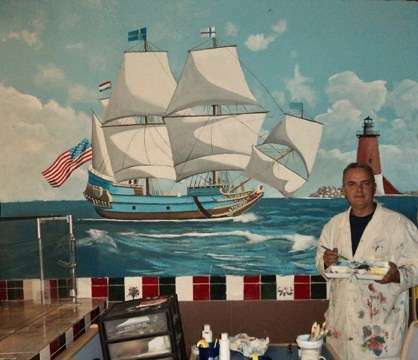 Artist Jesse Demolli is painting a mural of Kalmar Nyckel, the tall ship of Delaware and the Lewes Light house at Davinci's, Italian Restaurant in Lewes, DE. Mural at Marconis, Millsboro Delaware. Recall the joys of the past with nostalgic murals by artist Jesse Demolli. Murals on canvas or on the wall can commemorate people or events, evoke the warmth of a family gathering, or capture a moment of glory forever. Demolli Art Studio paints elaborate wall murals and trompe l'oeil in Delaware. We can design a mural for any decor, suit your living room, bath or business. Artist Jesse Demolli specializes in residential and commercial murals. Demolli Fine Art Studio works with interior designers, business owners, museums, contractors, event managers, theatres, homeowners and architects. Personalize your event or party with a cutout.